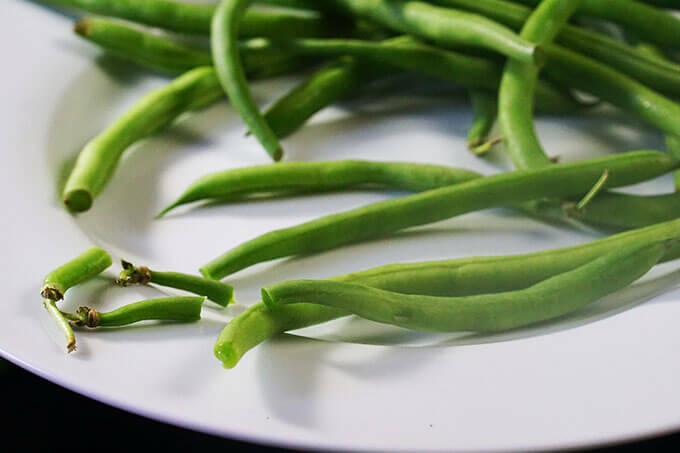 Steamed Green Beans are a super easy, delicious side dish that takes just minutes to make. With only three ingredients they take just minutes to make. Green Beans are perfect when paired with rich heavy meals and leftovers are always put to use. Green beans are a delicious, easy side dish! 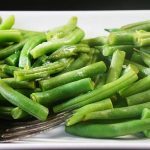 I want to share with you another recipe from our trip to New Mexico, which is Steamed Green Beans. As I had mentioned a couple of weeks ago, we’d visited with our friends Ron & Michelle in Santa Fe. Michelle had cooked up a storm and we were quite happy to sit back and enjoy her creations. Michelle is a marvelous cook! Over the years, one of the (many!) things I’ve learned from Michelle is the simplicity of a perfect dish. Sliced tomatoes, roasted carrots, sautéed Brussels sprouts, pot roast and lasagna – we were in heaven! One of the side dishes she served was steamed green beans. Simple and perfect. Steamed in the microwave they cook up quickly and don’t heat up the house (always an issue here in the Central Valley and during the summers in New Mexico also!) They take just minutes to make and are perfect every time! Green beans are readily available year-round. In the summer at the farmers market, in the bin at the grocery store or you can even purchase bags of pre-cleaned beans. Whatever works for you is best! Snap off the stems, no need to remove the tails. How do you prepare fresh green beans? Start by snapping off the stems (the tails you can leave on, no need to remove them). Then cut them into 2 inch pieces.. Rinse them well and place them in a microwave dish. How long does it take to cook fresh string beans? In the microwave it only takes 4-5 minutes to steam green beans perfectly every time! How do you cook green beans healthy? 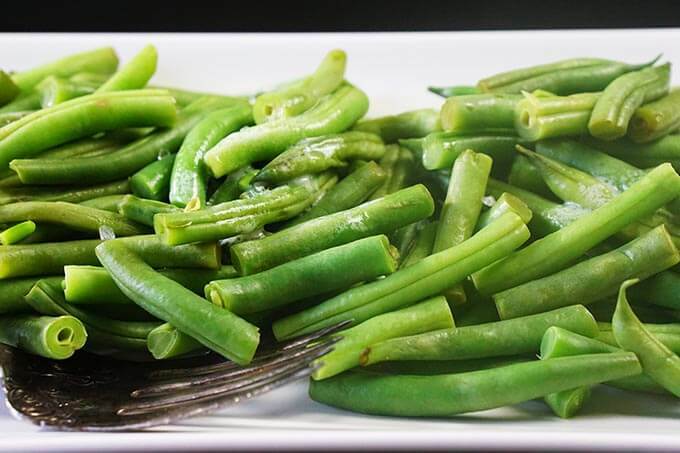 Steaming green beans is a great way to enjoy a healthy side dish. 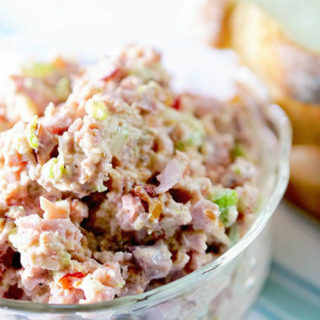 Topping with just one tablespoon of butter is a guilt free way of adding a ton of flavor! After removing the stems, cut them into two inch pieces. How do you steam green beans in the microwave? Snapping off the stems of the green beans, no need to remove the ends. Rinse them well and place them in a microwave dish. Add two tablespoons of water to the dish and microwave on high for four to five minutes. . Remove from the microwave and sprinkle with a teaspoon of soy sauce and add a tablespoon of butter, letting it melt over the top. 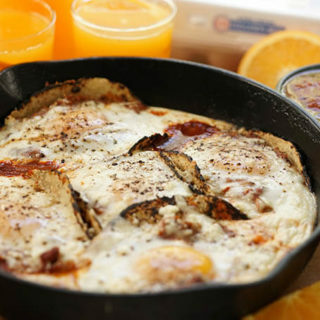 That’s it – perfect and delicious every time! Steamed green beans are great for a cookout or the holidays too because you’re not taking up valuable oven-space. If you keep the lid on the casserole dish the beans will stay warm until it’s time to serve. Perfectly steamed every time this is a great side dish. More recipes for healthy style green beans? Don’t they look delicious? This is a great side dish too because they compliment and balance when serving with rich heavy foods (like Thanksgiving!). 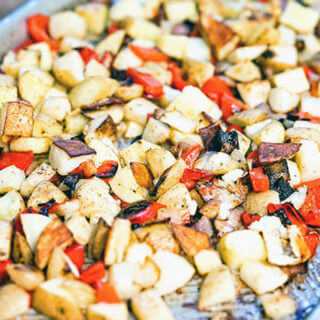 They are a quick, easy and healthy side dish. Click here to check out a great steamer basket for the microwave. Do you have a favorite side dish? Comment below, I’d love to hear from you! Don’t forget if you make this, please snap a picture and tag me on Instagram!! 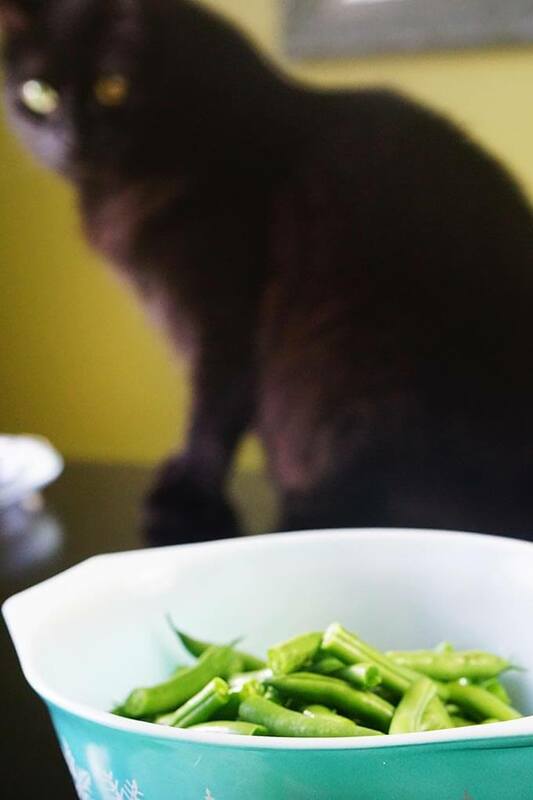 Steamed Green Beans – only 3 ingredients! 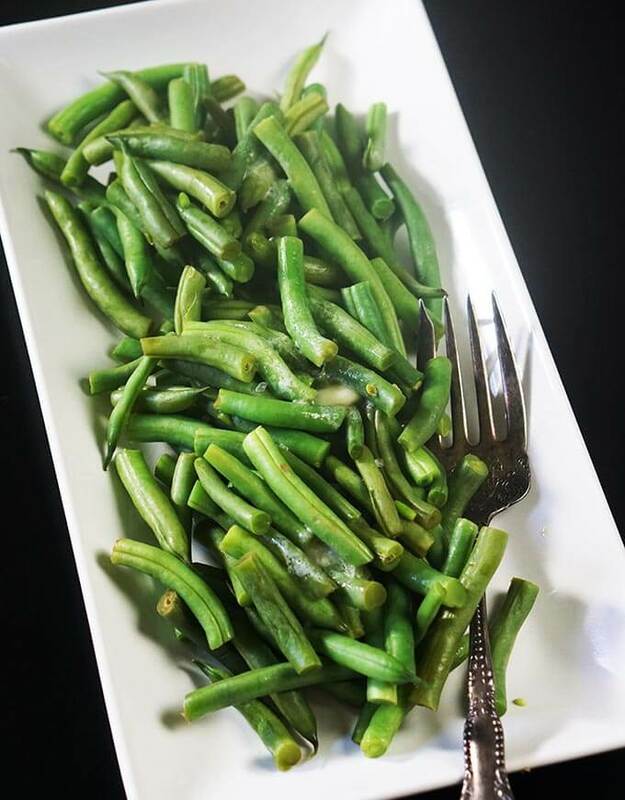 Steamed Green Beans are a super easy, super delicious side dish taking just minutes to make. They are perfect when paired with rich heavy meals and leftovers become a yummy snack or an ingredient for a great soup! 1 tablespoon of butter or more! Snapping off the stems of the green beans. The tails you can leave on, no need to remove them. Cut them into 2 inch (bite sized) pieces. Rinse them well and place them in a microwave dish. Add two tablespoons of water to the dish and microwave on high for four to five minutes. The exact time will depend on your microwave - check after 3 minutes and adjust the microwave time. Remove from the microwave and sprinkle with a teaspoon of soy sauce and add a tablespoon of butter, letting it melt over the top. Mix well and serve. That's it - perfect and delicious every time! This is a great dish for the holidays too because you're not taking up valuable oven-space and if you keep the lid on the casserole dish the beans will stay warm until it's time to serve. We missed you and Dan at dinner…what a fun week we all had. And nothing is easier than fresh green beans. We love Stella being your sous chef. She wants to make sure you get it just right. Funny. Yes we did have just a blast! It was so fun and YOU are such a fabulous cook! Sous Chef? Yes, I think you’re right that must be exactly what Stella thinks she is doing! 😀 Have a fun day my friend!! 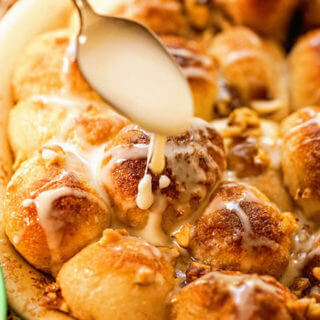 These look SUPER-YUMMY! Plus they are super-healthy! Thanks Liza – I hope you did get a chance to try this simple idea! In between Trick or Treaters last night we sat around and ate the leftovers with a fork! 😀 What can I say, better than eating candy, right? Hope you had a wonderful Halloween and thank you so much for the kind comments!! Green beans are one of my favorite legume side dishes. I never had them prepared like this but it sounds delicious! Pinning and stumbling!! 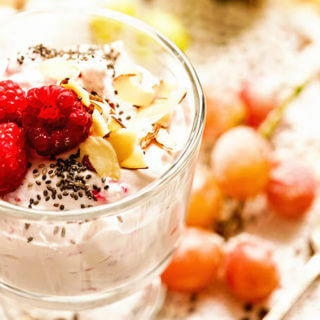 Love this healthy option, I hope you do too Ilka!! 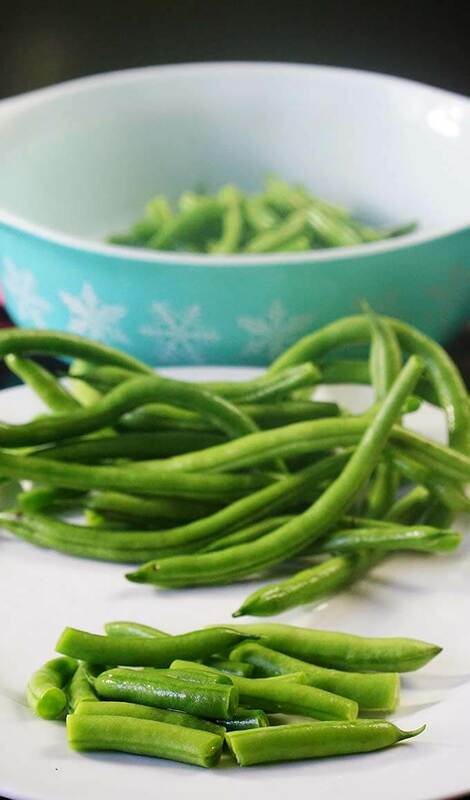 Green beans are one of our holiday tradition veggies. 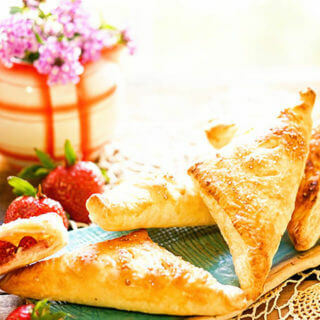 Your recipe looks delicious and I love that you kept these with a slight crisp. Thanks Sandi! I love bright crisp veggies and this just keeps things simple – thanks for stopping by!